The headstock is the primary working element of the lathe. Put simply, it is a frame or casting which houses various components, such as the spindle, bearings and drive system - to be covered in detail at a later date. Like the bed, the headstock can be made from many different materials, steel and cast iron being the most favoured materials. Again, mass is important to reduce vibration and flexing, so the more weight and the heavier the construction of the headstock, the smoother the operational running of the lathe. There are two styles of headstock, fixed and swivelling. A fixed headstock is permanently in line with the bed, see images 1 and 2. In other words, it is permanently fixed to the bed and is centrally aligned to the tailstock. This means that the component parts are locked into one cohesive, fully-aligned structure and should, therefore, assist in making the lathe more rigid. However, with this type of design, the diameter of the work that can be turned on the lathe is limited by the spindle centre height from the face of the bed. For instance, if the centre of the spindle was 6in (150mm) above the bed, then the lathe would have a theoretical maximum swing or turning diameter of 12in (300mm) - in practical terms this is not the case. There is no such thing as a perfectly round bowl blank (a piece of wood that has been sawn round), so the maximum practical swing would be in the region of 11 1/2in (293mm). It is also unlikely that anyone could fix a blank to the lathe so accurately that the full theoretical capacity could be used without the blank fouling the bed at some part of its rotation. Because the toolrest assembly sits on the bed, the swing capacity turning when between centres (where the workpiece is supported between the headstock and tailstock) is further reduced. For instance, a 1 1/2in (38mm) high toolrest base would reduce the theoretical swing diameter by 3in (75mm). At this stage it is worth mentioning that a few machines feature 'gap beds' - where the bed is of a deeper construction so that a gap or recess is created near the headstock, allowing larger diameter work to be turned, see image 3. A swivelling headstock (see image 4) is one which can be rotated off line from the central lathe axis, to increase the swing capacity for faceplate turning (work which does not require the tailstock to support the piece). As the headstock is not permanently fixed to the bed, and is required to swivel or rotate, it is inherently less rigid than a fixed headstock. It must have a centrally positioned locking mechanism - usually in the form of a bolt - which can be tightened, using friction to secure the headstock in the desired position. 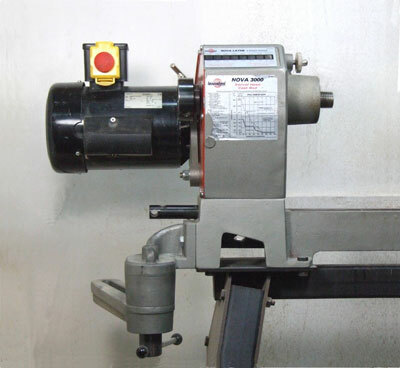 However, the further it is rotated, the more limited the use of the tailstock, toolrest assembly and bed. For instance, if the headstock is swivelled to a 90 degree position or more, the swing capacity increases dramatically because the work is now clear of the bed. At this stage the bed-mounted toolrest assembly cannot be used, so either a floor-mounted toolrest or a specialised toolrest attachment must be employed in order to profile or shape the work fully. Partially turning a swivelling headstock provides an opportunity for improved access and visibility and also facilitates a more comfortable working position. To take this principle on board, try thinking of your dentist, who has to contort his body in order to have clear access to a patient's mouth. If the dentist could straddle the patient's body, access would be much improved, the mouth would be easier to work on, and the operation would be safer for dentist and patient alike. "There are two styles of headstock, fixed and swivelling"